I layered Sage Shadow, Rose Red, Hunter Green and Vanilla. 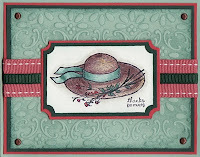 The Sage Shadow layer was color embossed with SS ink an using the Finial Press Textured Impressions folder. Congratulations! I just wanted you to know that your project will appear on the Yahoo Group Late Night Stamper’s blog finds of the day for January 5. Want to receive your own copy of the blog finds of the day? Join us at http://groups.yahoo.com/group/stampinuplnstampers/ or visit our Blog Finds of the Day Blog at http://blogfindsoftheday.blogspot.com. Very pretty, love these colors. Congrats on being selected for design team! !